HiepHoa always strives to provide high quality products and the best after sales service. Hiephoa’s guideline is to build customer’s trust through our core values to meet every requirement from any types of customers. Quality is our first priority. To ensure smooth operation, we have paid full attention to each part and item composing the special purpose system by using materials imported from G7 countries: Germany, Italy, Japan, and USA. Our key products are Fire Truck and Garbage Truck. - Our fire truck is of the best quality in ASEAN, far exceeded Korean counterparts and equivalent to Japanese. The truck has compact design, high traction, anti slicing capacity, especially compartment equipped with shutter rolling door and frames which are made of profile aluminum alloy, making the truck light and steady during transportation. - Another outstanding feature shall be monitor system from leading brand name in the world including AWG (Germany), Akron (USA); together with Darley pump and special purpose equipment from USA. - Garbage truck is continuously renovated. With exclusive use of Perform Steel instead of CT4, it not only boosts compact, but also raises durability while reducing kerb weight. - Loading garbage part is designed with suitable dimension for each type of special purpose bin and easy operation. - Owning 2 large volume manufacturing sites,Hiephoa group gains economies of scale by running Hiephoa Special Purpose Vehicle Factory and Hiephoa Fire and Rescue Factory with total area of 56.125m2meeting ISO 9001:2008 Standard issued by DQS GmbH – International Quality Management Organization in Germany awarded for environmental vehicles, fire fighting truck and other special purpose vehicle. - The factories are equipped with high tech and modern machines and equipment for manufacturing, checking and timely repairing damages and defectives. - Thanks to experienced team of technicians and staffs, we always try our best to search for imported materials from trusted brand name across the world with the most reasonable price. Besides, our products are directly distributed to the end user, therefore, customers enjoy competitive pricing with the highest quality and flexible policies. With a team of more than 300 skillful workers and experienced engineers, HiepHoa makes sure that the goods is ready for delivery from 4 to 20 weeks from the date of order. CUSTOMERS ARE FASTEST SERVED WITH THE BEST AFTER SALES SERVICE. Through more than 25 years of researching and developing, Hiephoa provides a wide range of products meeting any specialized demand. At present, Hiep Hoa is cooperating with renowned professors in Hanoi University of Science and Technology (the most prestigious university in Vietnam for technology) to invent new products for serving customers and the society. We are highly recommended by customers by our high quality products, diversity, and availability. 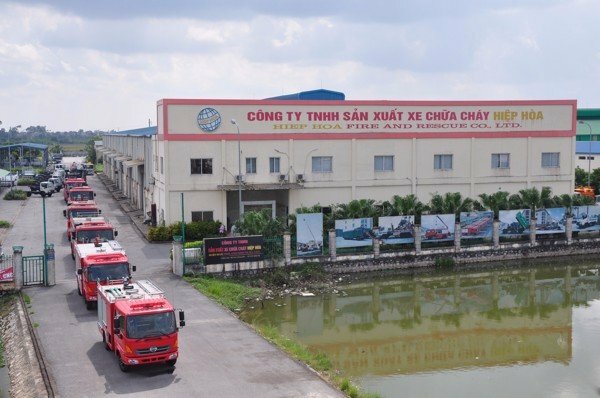 - Our clients in Security and Defense Sector are Ministry of Public Security of Vietnam (General Logistic Department, Police Department of Hanoi and other provinces, ...); Fire Fighting Department, Fire Police Department, …. - Clients in Environmental Sector include Urban Environment Companies from 63 provinces in Vietnam, Industrial zones & world-renown corporations: Samsung factory, VSIP Bac Ninh Industrial zone, VSIP Hai Phong Industrial zone, Northern Electricity companies, Nghi Son Refinery and Petrochemical, JGCs Consortium (the largest Refinery and Petrochemical cooperation in Japan, 5th ranking in the world). In 2012, Hiephoa Equipment of Environment and Trading Co.,Ltd overcame many obstacles in manufacturing and business. Because Hiephoa has been acting as a bridge between national and international partners to share opportunities and promote cooperations, we are proudly awarded “Golden Branch 2012” and “Impressive Logo and Slogan 2012”. 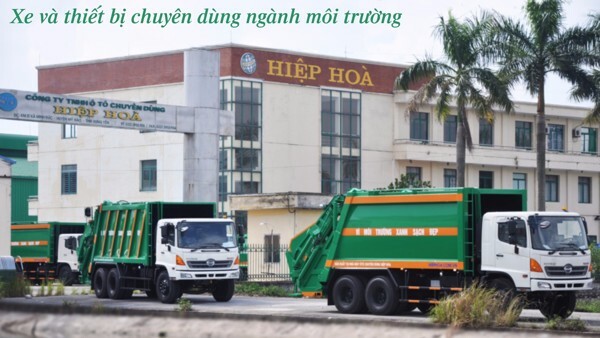 In 2007, Hiephoa has been certified in the list of 500 largest enterprises in Vietnam. Our guideline: SURVIVE TOGETHER - DEVELOP TOGETHER. We commit to providing the optimal solution for customer requirement of Specialized vehicles !